Maybe one of the most unglamorous parts of basketball is rebounding yet there is a direct correlation between rebounding and winning. Rebounding is also a great way for a player to create a niche for herself on a team. Maybe you can’t dribble the ball exceptionally well or possibly you’re not a good shooter – but if you live on the boards, the coach will find playing time for you. First and foremost, let’s understand what a rebound represents – a possession! That’s critically important. It doesn’t matter if it’s a defensive rebound or an offensive rebound, you have just given your team a possession that they may not have otherwise received. Excellent rebounding teams often win because they usually have a greater number of possessions than their opponent. It means they have more opportunities to scores while their opponents have less. Excellent rebounding teams usually win because they shoot a higher percentage. They shoot better because they rebound which leads to fast break opportunities. They shoot better because they get second chance opportunities on the offensive glass which often leads to a follow up shot from close in. Excellent rebounding teams usually win because they hold their opponents to a lower field goal percentage. They do this by keeping them getting out and running consistently. They also take away the second chance points on the opponent’s offensive end. Excellent rebounding teams usually win because they get to the free throw line more. They get to the free throw line more because of extra possessions they create for themselves as well as the ones they deny their opponent. How many times do you see a fouling situation occur on a offensive rebound put back? Excellent rebound teams usually win because they have more heart. It is heart that is a primary ingredient in good rebounding and if you have a big heart on the glass, then it is probably going to spill over to the defensive end of the court as well as the offensive end. A big part of rebounding is obviously technique and certainly we are going to talk about methods of rebounding – both individually as well as a team. We will delve into offensive and defensive rebounding and the various methods that are used for maximum results. But first and foremost, we should look at the make-up of a great rebounder. The individual that excels in rebounding has a special blend of physical and mental characteristics that allows her help her team on the boards. A good rebounder is a well conditioned athlete. Rebounding is one of the most tiring phases of basketball if a player is truly committed to rebounding. The pace of the game already makes is a demanding game but the good rebounder is going hard to the glass on every shot – and over the course of the game, that’s a lot of shots. So the good rebounder is going to understand the importance of conditioning. She is going to work hard with the team during conditioning and probably do a little on her own as well. She must be tireless in her approach. A good rebounder is physically strong. Because the good rebounder knows she must sometime move through people as well as over them, she can appreciate the work she must do in the weight room. This doesn’t mean she has to be big and muscle bound but she knows she must have the strength necessary to hold off her opponent when she is blocking out. She’s going to work hard in the weight room, more than the average player and she’s going to do the extra push-ups. Strength is important on the boards and there no reason in today’s game that she can’t improve in that area. A good rebounder is mentally and physically tough. Going to the boards is a very demanding job. It gets extremely physical inside with a lot of bumping and pushing. Some players don’t mind going to the boards occasionally, but the good rebounder is tough and not only does she not mind the contact, but she relishes it. She loves not only to receive the contact but likes to dish a little out as well. Mentally she knows the importance of rebounding and she blocks out any aches and pains. Mentally she also makes sure the contact doesn’t go too far. She wants to bang with her opponent but not to the extent that she draws a foul. Good rebounders are smart players. You have to be smart to read the where the shot may fall off…especially one shot by your opponent. The smart player can anticipate when and where her own team will shoot. She makes mental notes on opponents and understands their tendencies in terms of how she best get around them and get to the backboard. Good rebounders have a rebounding mentality. I’ve never seen a good rebounder that didn’t think every shot was a miss. When the ball is shot, they know that ball is not going in and they follow it’s path and try to make a read as to where it will come off. Part of that special rebounding mentality is they have a great hunger to rebound. The good rebounder loves to rebound more than she loves to score. Good rebounders have a strong desire to rebound – they are relentless. They go to the boards to try and grab the rebound. If they can’t grab the rebound, they are going to work as hard as they can to try and get their hand on the ball where the can tip to themselves or to a teammate. If they get bumped, they recover and keep going. If they get knocked down, they hustle up. They are not going to let anyone or anything stop from going to the glass. I’ve learned this from having the blessing of coaching one of the best rebounders I’ve been around – Anriel Howard. This past season, and it’s not quite over, she set the Texas A&M single season rebounding record. Despite only being a junior, she has become the all-time career rebounding here in Aggieland. She also owns the NCAA Tournament record for rebounds in a game — 27! And, please pay close attention — she is only 5 foot, 11 inches tall. But if you watch her play and see her grab a rebound in traffic, or chase one down you will see the biggest smile on her face. She genuinely loves rebounding. Coach Don Meyer always had a saying, “It’s not what you teach, it’s what you emphasize.” All coaches will readily agree to the importance of rebounding. But how strongly are you emphasizing it on a daily basis? One year at LSU, to commit to emphasizing rebounding, we decided to take the games leading rebounding to the post-game press conference after every game whether the press requested them or not. The player could’ve shot 2 for 10 from the field and turned it over 4 times but if she let the team with 13 rebounds that game she was going to the press room. It was are way of letting our team (and the media and fans) know that rebounding matters in a big way. Do you break it down in drill from every day? Are you pointing it out and holding players accountable in practice every day? Do you have rebounding stats that players can see on a daily basis? Do you watch specific video clips on rebounding? As a coaching staff, what are you doing every day to commit to improving your rebounding? 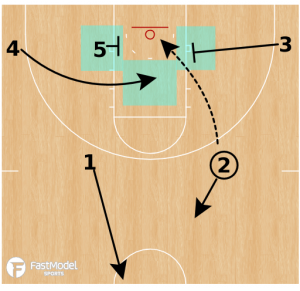 These concepts were posted to the FastModel Sports Basketball Plays and Drills Library by Jordan Peterson of Positionless Basketball. Examining some of the recent trends in offensive rebounding concepts. The weak side flood was made famous by Illinois coach Brad Underwood. The triangle concept is a more traditional approach. The abandonment concept is a new trend that many colleges and NBA teams like the Nets, Hawks, Spurs and Warriors have implemented. The top back concept. Players above the free throw line extended when the shot is taken are getting back on defense. Players below the free throw line extended are crashing the offensive glass. Red: Opposite Inside-player from the strong side of the shot circles under the rim to the weak side of the shot. 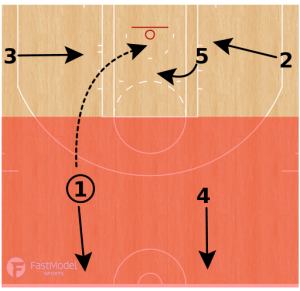 Yellow: Weakside Flood-next two or three players flood the middle and weakside of the floor. 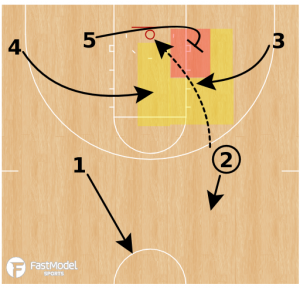 PG retreats for transition defense. PG and shooter retreat back on defense. The other three players fill the strong side block, weak side block and middle lane to form a triangle. 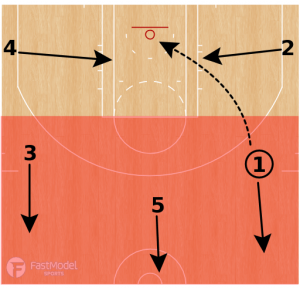 Sending all 5 players back on defense or allowing best rebounder to crash the offensive glass while the other 4 players get back on defense after a shot. 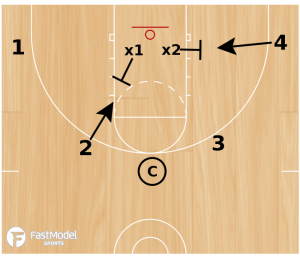 1 and 4 are above the free throw line extended so are sprinting back on defense. 2, 3 and 5 are below the free throw line extended so they are crashing the offensive glass. 1, 3 and 5 are above the free throw line extended, so they are getting back on defense. 2 and 4 are below the free throw line extended and are crashing the offensive glass. 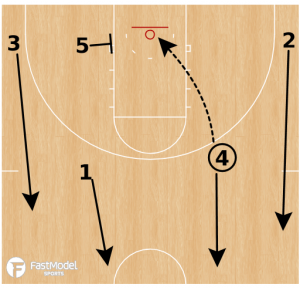 This rebounding drill is presented by Utah Head Coach and 9 year NBA player Larry Krystkowiak. The clock runs for 4 minutes and only runs during live action of the drill. Both teams are on offense for 4 minutes during the drill. The coach passes the ball out. The defenders coming from the block base their closeouts on the abilities of the player they are guarding. Coach Krystkowiak uses the term “Rondo” for a driver, “Allen” for a shooter, and a “Durant” shooter or a driver.